They don'thave snow or ice, but an international team of astronauts held their ownweightless Winter Olympics this week. Their venue: a $100 billion spacestation. The 11astronauts aboard the linked shuttle Endeavour and International Space Station(ISS) tried their hand at several spaceWinter Olympics events this week during breaks from adding a new room andobservation deck to the outpost. Theirevents? Space skiing, the zero-G luge and agraceful weightless figure skating. The crew beamed some space sports video oftheir antics to Mission Control. 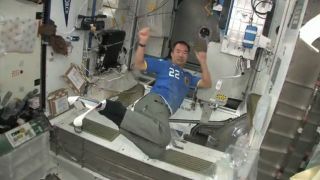 Japaneseastronaut Soichi Noguchi, a space station resident, even donned a pair of shortspace skis for his slalom and jump events. "I didsend out my ski jump on ISS," Noguchi told reporters in Japan lateThursday. Endeavourshuttle pilot Terry Virts took a shot at the luge,floating down a space station module feet first. His crewmate Kathryn"Kay" Hire twirled endlessly in what the spaceflyerscalled the ultimate "figure skating triple-lindys." Virts saidhe and his crewmates have enjoyed looking down at Vancouver in BritishColumbia, Canada, where the 2010 Winter Olympic Games are in full swing. "We'vebeen having some really nice night passes over the Olympics," Virtsradioed Mission Control early Friday. They alsosqueezed in some zero gravity diving — basically somersaulting whilefloating in place — though admittedly they should probably save that forthe Summer Olympics, the astronauts said. And like theOlympics, the shuttle and station astronauts even have a special emblem. Butinstead of five interlocked rings, they have mission patches emblazoned ontheir space clothes and equipment. Playingsports in space is nothing new. Astronaut AlanShepard— one of the first seven NASA astronauts — played golf onthe moon in 1971 during the Apollo 14 mission. His first swing was a bust,but he hit home on the second try — his ball going for "miles andmiles," he radioed Mission Control at the time. Thirty-fiveyears later, Russian cosmonaut Mikhail Tyurin whacked agolf ball off the International Space Station as part of a publicity stunt. Agolf jacket is still on the space station today. But thereare some sports that have cropped up that defy any Olympic category. Spacestation astronauts have come up with their own zerogravity sports. One involves tossing hefty bags of water around likemedicine balls, then jumping on them while they move to see how far they couldride in weightlessness. They havealso held relay races from one end of the space station to another andchallenged one another to float as far as they could without touching anything.The space station has about the same living space as a Boeing 747 jumbo jet. Still,Earth's Winter Olympics stoke the international spirit of the space station andshuttle astronauts. Currently, there are six astronauts on Endeavour —all from NASA and American. But one, mission specialist Nicholas Patrick, wasborn in England. The spacestation is home to five spaceflyers: twoRussians, two Americans and Noguchi. Noguchi, whorepresents the Japan Aerospace Exploration Agency, told reporters in Japan thathe has been keeping up with the Winter Olympics as much as possible,particularly because Japan has won a few medals. His favoriteso far: ski jumping and figure skating. Noguchi has been using the station'sInternet connection to keep current on the Olympic standings. "I knowthat there are wonderful athletes there, so we're hoping for greatmedals," Noguchi said in a message of support to the Olympic athletes. "I look forward to that. Good luck to you all." Noguchi andhis crewmates will say a final farewell to the Endeavourshuttle crew later today. The shuttle is due to undock from the spacestation tonight at 7:54 p.m. EST (0054 Saturday GMT). "You are officially the only folks who are able to getmore hang time then Shaun White," Mission Control said in a message. White, the American snowboarder, took the gold Wednesdaynight in the men's halfpipe at the 2010 Winter Olympics in Vancouver, Canada. Endeavourand its crew are wrapping up a 14-day mission that delivered the newTranquility room and Cupola observation deck to the $100 billion space station.The astronauts locked themselves inside the shuttle early Friday morning toprepare for tonight's undocking, after saying farewell to the station crew. "Quietdinner," Noguchi wrote on his Twitter page (Astro_Soichi)after saying farewell. "I already miss the shuttle guys."